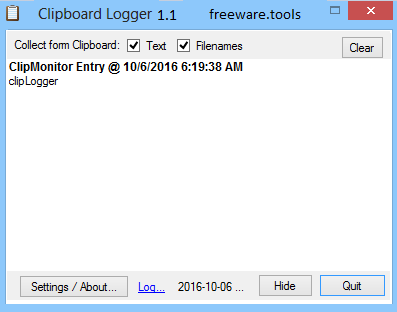 ClipLogger is a free tool which collects and combines clipboard text. Launch the program and an empty pane appears. Individual chunks of text are added to the pane as you copy them to the clipboard, and when you're ready you can select some or all of these and copy them elsewhere. ClipLogger also works with file names. Select files in Explorer, right-click, choose Copy, and their path and file names are added to the list. This enables selecting multiple files from anywhere on your system, and producing a plain text list for reuse somewhere else. Useful settings include the ability to launch the program with Windows and back up the contents to file. Even though copy and paste is one of the most used and powerful function in Windows, you should know that you can enhance its capabilities by employing a clipboard manager. As the name suggests, clipLogger is a lightweight piece of software that enables you to record filenames, path and text snippets that you copy while using the computer. The program does not require installation per se, but rather you can unpack it in any desired location on your local drives. The interface that consists of a single, resizable window is minimalistic and plain, yet appropriate for the role of the utility. You should know that the idea behind the app is to let you capture anything that you copy and paste so that you can use it at a later time. Considering that the tool can grab quite an impressive amount of data and you may be looking for a specific piece of information at some point, you should keep in mind that you can add a timestamp to the entries. It is worth mentioning that the program can be customized so that it better suits your needs and preferences. Consequentially, you can set it up to start with Windows or close to System Tray, so that it continues capturing data without distracting you from the task at hand. For enhanced convenience, you can configure the app to keep the links that are included in the content as links that can be easily accessed. In addition, you can space out entries, specify the maximum logged length and create backups for all the data that you are capturing. In the eventuality that you are looking for a non-intrusive, but reliable utility that allows you to preview and edit data that you have been working on during the past few days, then perhaps clipLogger might lend you a hand.